There’s something about the sound of food hitting a hot cooking surface. Anticipating the krUSHizzle that means you’re on your way to grilling nirvana, but all you get is phtz. Or, worse still, complete silence. You were so sure enough time had passed for the grill to heat but it’s just not there yet. I feel your pain. Or you didn’t feel enough pain. The time-honored method for determining when the grill is ready is the number of seconds you’re able to hold your hand 4 to 5 inches above the grate. The range is 2 seconds (350° F) to 8 seconds (220° F). But maybe you’d care for a less tactile method. A non-touch thermometer would make testing the grill a much less painful experience all the way round – and will be way more accurate. Thermometers should be considered a standard tool for any well-equipped cook or grillmeister. You may have seen aim-and-measure thermometers in passing, but if you’re ready to do something to avoid another disappointment at the grill, it’s time for a closer look. In this article, I will introduce you to the wonders of infrared (IR) thermometers. 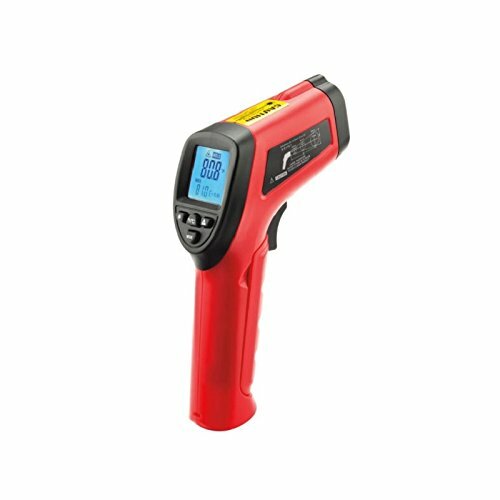 You’ll learn how infrared works, what makes a good IR thermometer, discuss the features of the top 4 and ultimately help you determine which is the best infrared thermometer for your needs. When Would a Cook Use an IR Thermometer? One of the biggest challenges of taking the temperature of extremely hot or cold materials is safely getting a good reading. 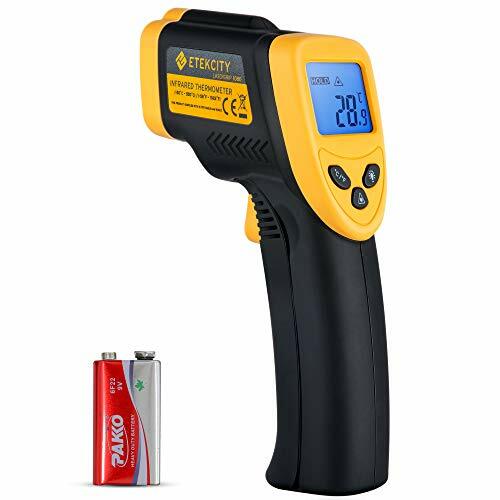 An infrared (IR) thermometer is in the family of thermal radiation thermometers which allows you to take temperatures at a distance, from mere inches to a few feet away from the grill. For that reason, they are called non-contact or non-touch thermometers. A more descriptive term is temperature gun because of their L-shape, and how a temperature is taken – aim and squeeze the trigger. Originally designed for industrial use, IR thermometers are accurate to within 1 to 2 percent of the desired temperature. But industrial-level precision accuracy isn’t as important when grilling or in the kitchen. But let’s start from the beginning. What is infrared? In 1800, British scientist Frederick Herschel, when testing a theory that different waves of light held different temperatures, discovered higher temperatures in an unlit area of the test surface. He named this invisible light calorific rays, but it eventually became known as infrared waves or light, the most common type of light produced by our sun. Infrared has been used in scientific, industrial, and medical applications to heat and detect temperature. It only measures the outside, or surface, temperature of an object. In the specs of your IR thermometer, most likely you’ll see a statement on whether or not the tool can be adjusted to different emissivity levels. Emissivity is a measurement of a material’s ability to emit or absorb light. If you’re planning to use the thermometer for non-cooking uses and will be using a variety of cooking surfaces, you’ll need a thermometer with adjustable emissivity to be sure of an accurate reading. Emissivity tables can be found from several sources online. Your hand doesn’t char when you try to get a temperature because neither you or your thermometer need to be close to the grill. Cross-contamination of foods is avoided. Ambient temperature changes can throw off a reading if they change suddenly. Radio frequencies can throw off a reading at or above 3 volts per meter. Infrared can’t measure the temperature of transparent (glass, water) or shiny (metal) material. To check the cooking surface – metal, stone, salt block – to see if it’s sizzle ready. To monitor different temperatures on the grill; say you’re warming sauce or steaming veggies on the right side and grilling chops on the left. Ensure the temperature stays optimal throughout a temperature-sensitive cooking process; for example, melting chocolate must stay between 104° and 113° F.
When you need to know more than what the dials on your stove are telling; setting the burner to High or 9 doesn’t tell you when the pan is at 400° F and ready to sear the flavor into a prime steak. To calculate defrost and cooking times for a large frozen bird or roast. To find arctic spots in the refrigerator. When testing food for doneness. Again, infrared only measures the surface, the outside, of its target. You’ll need a probe thermometer to find out if the inside is done. Measuring through glass. Although it’s a cool effect to see the laser go through one side of a glass container and out the other, the IR wave gets stopped at the border. Specially treated glass may allow IR through, but that’s more in the realm of insulated windows and solar panels. Measuring through water. Ditto on the above. To measure a cup or pan of heated water, you’ll need to give it a good stir before aiming the laser straight down into the water. Figuring out the temperature of a metal pan. A material like stainless steel reflects the room’s temperature outward; an IR thermometer will only tell you the room’s temperature. To get an accurate temperature for the pan, aim inside at the bottom or side. For the best measurement, hold the thermometer at a 90-degree angle to whatever you’re measuring. Doing this gives the spot a clean border, making for a better reading. Know the distance-to-spot (D/S) or distance-to-target ratio for your device. It may also be referred to as the optical reference. In the specs, look for two numbers framing a colon. The ratio describes the size of the area being measured based on how far back you stand. The ratio is commonly 8:1 to 12:1 which means you can get an accurate temperature in a space of 1 diameter while standing 8 or 12 feet away. Generally, the further back you stand, the larger the area being measured. A premium IR thermometer would have a 12:1 D/S ratio or greater. The red dot of the laser is not where the temperature is being taken. Since the infrared can’t be seen, the laser is a finger pointing to the general area. The actual measurement can be to one side, below or above it within a certain diameter. Some thermometers feature two lasers that frame the measurement area in between the dots. The user’s manual should detail the location of the measurement area. When taking the grill’s temperature, make sure you’re not aiming past the grate and getting the temperature of what’s below. Heat a griddle or pan on the grate and take the temperature from there. Hold the IR thermometer steady in one area. Especially with large food items, the temperature can vary from one part to another because it’s cooking at different speeds depending on the fat/water/muscle/fiber composition. Differing temperatures can also be found on pans, grates and salt blocks. For safety’s sake, resist the urge to point the laser at anything with eyes. Any laser can damage eyes. Belt clips are basically it for these thermometers. Tripods can be ordered for or may come with industrial models when sustained measurements are needed. But rarely would such a thing be useful for the grill or kitchen; unless you have something dependent on reaching or keeping a specific temperature. One model in the roundup review comes with a nifty reversible neoprene sleeve said to improve the grip. But then the nice color of the thermometer is obscured. Cost can be a factor when considering what would best suit your need. Once you get the thermometer, you may discover more uses than you thought possible. Because, well, it’s fun to use. It may encourage you to branch out to candy making or brewing or soap-making. You may find yourself galloping around the house checking windows and doors for drafts or – you get the idea. If you are working with a variety of cooking surfaces (metal, wood, salt, ceramic), adjustable emissivity is an important feature. The grip and weight can matter if you have arthritis or other hand grip challenges. Temperature range is important for industrial applications because realistically, when preparing food, you’re not going to care if a thermometer can measure 1022° F. But you may care to know if it can switch between degrees Fahrenheit and degrees Celsius. Now that you have the basics of the science, features, and uses of an IR thermometer, let’s look at four best-sellers. 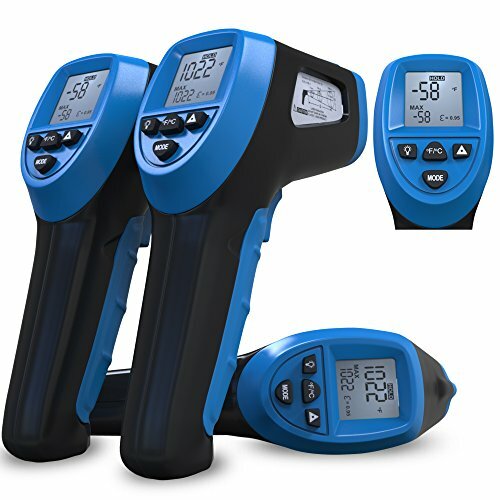 The following are our picks of 4 best IR thermometers of the dozens of models available. They all have great features, are easy to use, and highly suitable for taking temps of grilling surfaces and the insides of wood fired ovens. I like the solid history of the 62 MAX Plus. For decades Fluke, its manufacturer, has been ranked best in business for measuring different types of equipment across industries. The Max 62 Plus lives up to its heritage, it is dust- and water-resistant and can survive a drop of nearly 10 feet. At 9 ounces and with dimensions of 6.9 x 3.3 x 3 inches, it is the heaviest and largest of the four. But it’s fast, able to record a temperature in less than 500 milliseconds. The two rotating lasers are one of the tool’s best features because they make it easier to the area being measured. Out of the box, the lasers must be activated. If the pictogram isn’t helpful, tutorial videos are available on the Fluke website. Other helpful features include an automatic shut-off after 10 minutes of inactivity to extend battery life, a large backlit display, and a belt clip. For me, the lack of clear instructions is a huge detraction; beyond a few pages of specs, the manual is devoid of words. The pictograms may make more sense to someone familiar with the functions of an IR thermometer or someone good at solving picture puzzles. I was glad to find descriptive videos on the Fluke website and YouTube. One owner uses 62 MAX+ to know when his pizza stone is ready for use. The right temperature is critical because the crispness of the crust depends on the stone being heated just right. And he doesn’t have to guess when it’s cool enough to handle after the cooking is finished. If you don’t mind paying for a truly top of the line IR thermometer and don’t think you need to look any further, then click the link below for futher info. Otherwise, keep reading and then decide if you want to come back. Like MacGyver, I never mind using a tool for something outside of its intended use. So, although the 8.1 x 4.7 x 1.5” profile of the 1080 reminds me that it’s on leave from the boiler room, this thermometer seems to do just as well in the kitchen or at the grill. It has a slim profile but is one of the heavier products here. The plastic and glass have a delicate feel; durability may not be its strong suit. Some initially found it hard to accurately position the laser pointer. I guess it’s good that the laser can be turned off if you’re feeling ambitious. The 1080 features a nice, easy to read backlit LCD screen. The last temperature recorded will display even after the trigger is released. It gives better temperature readings from further away than other IR thermometers and can easily shift from cold to hot measurements. The 1080 comes in handy for finding hot spots in pans or grills. I like that the manufacturer clearly tells that the surface being measured is about 2cm below the pointer. That information isn’t always so easily found. Using the Lasergrip 1080 is a fast and (literally) painless way of learning when your microwaved coffee is at a safe drinking temperature. So what if you feel you’re borrowing from the tool shed. The 1080 can make a valuable contribution to your food prep tools. It doesn’t have the brand history like Fluke but it has a lot of the features at a lower cost. Contrasts can be interesting, especially when they don’t get in the way of a product’s functionality. The LT-02 is a study in contrasts; at 7.2 ounces, it’s one of the heavier products reviewed here. But it has a slim grip which makes it easier to handle its 7 x 1.5 x 2” dimensions. This is good news for anyone who may have difficulty with hand strength or reach. Maverick has been creating thermometers and grills for home use since 1982 but, even with its red color, this product would seem to be more at home in a toolbox. Nice features include the ability to take a reading from 5 feet away (although it’s best within 2 feet) and the batteries level displays on the screen. The LT-02 is fast but some find it doesn’t test as accurately as other models. The backlight is always on, which can make reading it awkward at times. Some complain the laser doesn’t point straight, which is funny if you’re geek enough to know what it takes to bend laser light. My guess is the complaining parties need a little coaching in how to hold the LT-02 properly. Some owners found it worked quite well on a Himalayan salt block. Besides checking food temperatures, you could put it to use verifying readings of built-in thermometers (on electric appliances). There isn’t much to say about the Maverick. It works, is easy to hold, and priced well. If you’re looking for an occasional tool to give a general temperature measurement, you can;t go wrong with this model! I don’t like gory movies. Especially if they’re science fiction-flavored since most have little to do with science. And that’s my issue with this last product. Someone was so in love with a sci-fi franchise that their technically perfect thermometer was named after it. I find the product ad ridiculous, full of hunt-track-kill language that took me far from the joy of grilling. I doubt any grilling enthusiast approaches their grill as an adversary to be stalked and laid to waste. But, looking past what I consider poor marketing, the Thermal Predator is an IR thermometer with great features. Unlike the other three in our review, this one looks as if it belongs in the kitchen. Its striking blue color is a refreshing change from the industrial-looking yellow, red, gray and black of the others. It’s the smallest in our review roundup at 4.8 x 1.5 x 6 inches. Neat and compact, it weighs 4.2 ounces. Other features include an easy-to-use battery compartment door, audio feedback to signal when temperatures are out of the desired range, and a backlight that can be toggled so you can read the screen at night as well as during the day. A neoprene sleeve that improves the comfort of the grip is included in the box. Naturally, it’s in camouflage and black, to go with the slay-the-enemy theme. The trigger has a hold button in case you need to get sustained measurements without cramping your hand. This is the company’s first product, launched in 2014 exclusively on Amazon. Now it can be found on eBay and other sellers. They have been known to contact new owners to poll them about their satisfaction. Buying the Predator automatically registers you to receive helpful tips on using it, some have found this annoying. You can opt out of receiving those emails. The manufacturer is short on useful information, like the D/S ratio or the emissivity level. And I’m a little baffled as to why they would give a 60-day money back guarantee on a product with a 1-month return policy. But it does well what it’s designed to do. It comes in handy if you have your grill firing at different temperatures, say you want to steam veggies on one side while the chops are doing their thing on the other. Inside the house, Predator has been used to find arctic spots in the fridge. Infrared thermometers make sense for so many reasons. The no-touch feature is key to safety basics: a reduced risk of burn or injury and minimized risk of transferring bacteria from fish to meat to fowl or vegetable. There are so many non-food uses; this tool shouldn’t have to sit too idle. Of the four products reviewed in the roundup, looking solely at function and not marketing, I would choose the Thermal Predator. But it misses out because the emissivity can’t be adjusted. 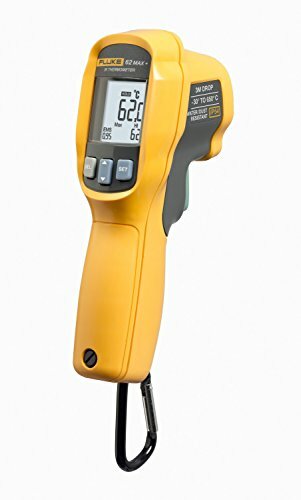 So, in speed, grip, D/S ratio, and being able to use the thermometer on a variety of surfaces is so important, despite its higher cost and the lack of written instructions, the 62 Max+ by Fluke wins our Most Recommended nod. Which features matter the most to you? What uses have you found for your no-touch temperature tester? Let us know in the comments below. Best BBQ Tools and Grill Sets – Make Grilling Easier and Fun!